When is the best time to travel to the Everest region of Nepal? It is possible to travel to Nepal throughout much of the year, though for walking and trekking in the Everest region of Nepal, the best time to go is in spring (March-April) and autumn (October-November). 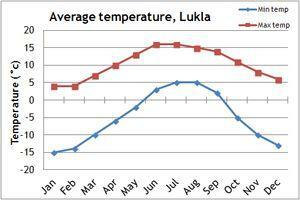 Our temperature and rainfall charts will give you a guide to the climate in the Everest region. Between March and April, the weather begins to warm up, and a whole range of Everest trekking options are available. Skies may be more cloudy than in autumn, but the beautiful rhododendron and magnolia will be in bloom. Some of our holidays are timed to depart during the Easter period. 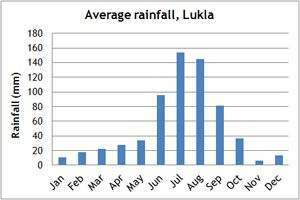 In summer, from June to August, Nepal experiences the monsoon rains. As well as travel disruption, there are no mountain views, so trekking in the Everest region during the summer is not worthwhile. There are alternative mountain ranges which are at their best during the summer due to lying in the rain shadow, such as Mustang and Dolpo. Autumn is thought to be the best time to visit the Everest region. With dry weather and crisp, clear skies, the mountain views are at their best. The countryside is green and lush, following the summer monsoon. However, during this period the popular trails can be busy, and flights book up quickly, so do book in advance if you want to trek in Nepal during the autumn. We've introduced many treks which will get you off-the-beaten-path, and away from the crowds during this season. In winter, the days are generally dry and bright, though at altitude the evenings will be extremely cold, and some high passes can be blocked by snow. Although a high-altitude trek may not be possible, winter can be a great time to visit Nepal, as there are fewer tourists. There are some fantastic walking and trekking holidays which are perfect for an adventurous winter holiday. You can even trek to Everest Base Camp during the Christmas holidays. If you can't make the dates of our group departures, then take a private departure on dates to suit you, or we can create a Tailor Made holiday to the Everest region of Nepal, especially for you and your family or friends.